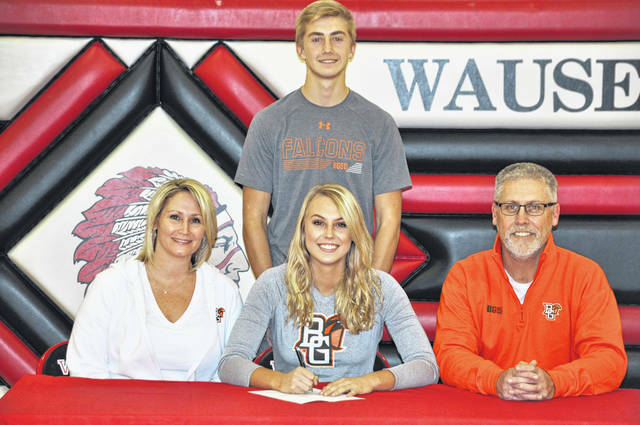 Lexi Sauber of Wauseon recently signed a letter of intent to continue her education and volleyball career at Bowling Green State University. Pictured, front row, from left, are Andrea Sauber (mother), Lexi, David Sauber (father). And, back row, Noah Sauber (brother). Wauseon senior Lexi Sauber has signed to continue her volleyball career at Bowling Green State University. Sauber was named back-to-back Northwest Ohio Athletic League Player of the Year her junior and senior seasons. She led the Indians to their first NWOAL title in 25 years. Also joining the program as a freshman in 2019 will be Madelynn Luebcke of Stevensville, Mich.
Sauber is the daughter of Bowling Green alumni Dave and Andrea Sauber. Dave was a member of the Falcons’ football team during his years as an undergrad.